Digital version has extra pages and discounts. Keep up on what's happening in the snow industry and Far West. As a member of a club that belongs to a Council in the Far West family, you are automatically a member of FWSA and entitled to all the benefits. FWSA covers twelve states with TEN regional COUNCILS with more than 150 CLUBS and a combined membership of over 50,000 skiers and snowboarders. Far West Ski Association has an extensive recognition and awards program. Over the years, Pacific Rim and our members have won numerous of these Far West awards. There are a variety of programs for individuals. Submittal deadline is March 19, 2019. Details and applications can be found at http://fwsa.org/MemberCorner/Programs/programs.html. Far West is offering three great prizes that require some thought and work but yields a big reward. Environmental Awardee wins a 5-night ski trip for two to Aspen/Snowmass, CO.
Western Ski Heritage Awardee wins a 5-night ski trip for two to Steamboat, CO.
Safety Person of the Year wins a 4-night trip for two to Telluride, CO. Which one is best for you? Download a comparison. 36 resorts for the 2019-2020 season. 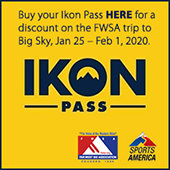 Download a list of the differences between the Ikon and Ikon Base Passes. Locals complain about crowded slopes and blame the new inexpensive consolidated passes. Download what some resorts are saying. Download an opinion on the effect retiring senior skiers are having on the future of skiing.